Located in Santa Fe, New Mexico, Hacienda Nicholas is an enchanting bed and breakfast offering guests a true taste of the Southwest. You will find peace and tranquility behind our thick adobe walls, along with fabulous full breakfasts featuring a variety of local dishes, all made with fresh organic and natural ingredients. We are also members of the Green Hotels Association and endeavor to be as eco-friendly as possible while offering the finest in guest services and comfort. A new addition to the inn is Absolute Nirvana Spa, a luxurious Indonesian-style spa in our back garden. Recently selected by Conde Naste Traveler as one of the hottest new spas in the world, we offer traditional Asian spa rituals and luxurious rose petal baths, along with therapeutic, hot stone, Thai massage and a selection of facials. We welcome you back from your day of touring with a wine and cheese happy hour or cookies & teas. After a memorable dinner at one of Santa Fe's fine restaurants and star-gazing from the garden courtyard, you will happily melt into our heavenly beds of feather and down. At the Hacienda Nicholas we offer all the amenities of a fine hotel along with the warmth of staying with good friends. 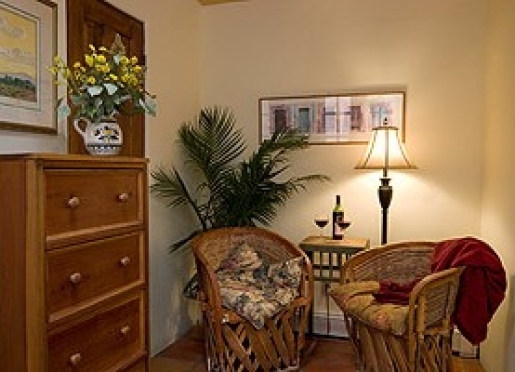 "One of the best B&B's we've ever encountered." The inn is named after owner Carolyn Lee's son, Nicholas. The nearby Madeleine is named after his twin sister, and Alexander's Inn up the street is named after their older brother. In naming these Santa Fe bed & breakfasts after her children, Carolyn brought together her two passions in life. The family connection carries over into the feel of all three inns. Try the Hacienda to enjoy a bed & breakfast that combines the warmth of an in-home environment with the amenities of a Santa Fe luxury hotel. At the Hacienda Nicholas we offer all the amenities of a fine hotel along with the warmth of staying with good friends. Travelers are always looking for memorable and relaxing experiences. Let’s discover more through the words of our innkeepers. Many thanks to Carolyn Lee for sharing her own secrets with BBOnline.com! 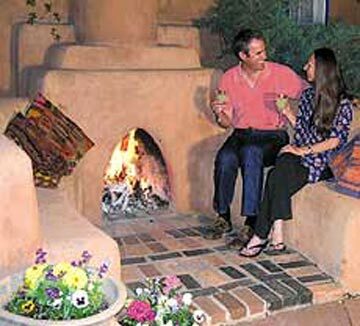 The Hacienda Nicholas is a top choice for travelers looking for an authentic adobe hacienda. The inn features thick adobe walls, beamed ceilings, a quiet and enclosed garden courtyard and kiva fireplaces in some of the bedrooms. 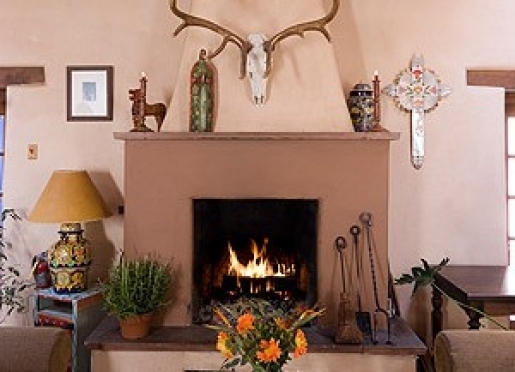 The architecture, furnishings and art are all quintessentially southwestern. Also, we are just a three block walk to both The Plaza and Canyon Road. We are best known for our traditional adobe architecture, proximity to the Plaza and Canyon Road, and our fabulous breakfasts, using local, natural and organic ingredients. We are unique in that our inns (including Alexander's Inn and The Madeleine) are the most eco-friendly in Santa Fe. There is a page on our website detailing all we do that is eco-friendly. I most love the authentic adobe building, our sweet garden, our warm and friendly staff, and that we are so eco-friendly. Not sure if there is an absolute #1. Santa Fe is known for its history, culture, arts, food, scenic beauty and outdoor offerings (skiing, hiking, biking, fishing, etc). 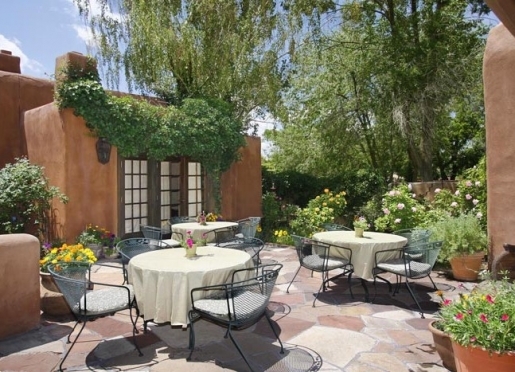 "We have stayed at lots of B&B's in Santa Fe over the years, and this is by far our favorite!" Most people have no idea how much there is to do in Santa Fe. They plan a trip of only a couple of days, but then find there is ever so much more to do and then plan to come again. We have booklets in each room with a full eight days of activities, and even that is only scratching the surface. Canyon Road Art Galleries, Museums (Georgia O'Keeffe, History Museum, International Folk Art, Wheelwright, Spanish Colonial), visit Puye Cliffs or Bandelier (ancient cliff dwellings of the Anasazi Indians), take the high road to Taos to see Chimayo and the Taos Pueblo. The Plaza and Canyon Road, full of shops, galleries, museums and restaurants, are only a few blocks away - an easy walk. I love the tapas at La Boca, and The Shed offers the best traditional New Mexican food. Both are just a few blocks away. 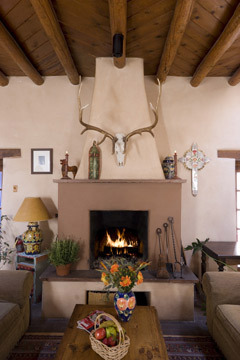 We have a link on our site to our own Eight Day Santa Fe Itinerary haciendanicholas.com/About_the_Inn/Santa_Fe_Itineraries/index.html. There is also santafe.org and santafe.com - both feature attractions and events. There are seven rooms - three are especially quiet and private, with separate entrances opening off the garden courtyard. They offer king beds and fireplaces. There are four smaller rooms in the main building, all with queen beds. We welcome pets, and charge $25 per pet per stay. No Southwest vacation is complete without delicious food. In the morning, savor the aroma of fresh-ground, locally-roasted organic coffee and just-baked muffins as you snuggle in bed just a few moments more. 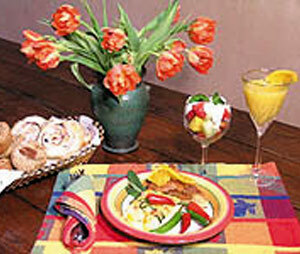 Every Santa Fe inn offers breakfast, but the Hacienda was the first to transition towards a fully organic breakfast buffet. 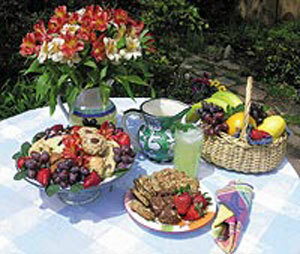 Hacienda Nicholas makes a special effort accommodate those seeking a healthy, organic and vegetarian bed & breakfast. Our generous breakfasts feature Southwestern frittatas, enchiladas, flapjacks, waffles or other delights that change daily. Accompany your hot entree with our homemade breads and special granola, muesli, fresh fruit salad, whole grain breads and yogurt. When word of our cuisine spread to the food editor of The Santa Fe New Mexican, our recipes drew headlines! From spring to fall, enjoy breakfast outdoors where bird song and flowers greet the day. On chilly winter days, feast by the roaring fireplace of the welcoming "great room." After a day of exploration, we welcome you home with overflowing plates of cookies, cakes, and brownies. Wine and cheese are served each evening at Hacienda Nicholas - under a canopy of stars in the garden courtyard, or in front of a crackling fire in the inn's great room. Over the years our guests have asked for our breakfast recipes, particularly those of our Migas, Southwestern Frittatas, Callabacitas Breakfast Enchiladas and Blue Corn Waffles. Others have requested our afternoon cookie recipes, including Russian Tea Cakes, Lemon bars, Apricot White Chocolate Cookies. Still, the most-requested recipe is for our Daily Granola - a favorite now for 20 years! We are happy to share these and other recipes.